In one corner of a bustling street in Seoul's Hongdae district popular with young people, 30-something office worker Lee Choon-han's face is glued to the glass of a coin-operated claw machine. For about $1, Lee can drop the claw twice to try to grab prizes such as plush toys, key chains or cheap watches. After three failed attempts, his skill pays off and he captures a Pokemon doll. "Every time I go past this street, I play it. If I win, I feel as though it awards a small fortune to me, although I don't succeed every time," grinned Lee. Asked why he started paying attention to the claw machine, Lee replied, "It offers a moment of fun and thrill with a small amount of money. Even if I lose, I don't feel it was a waste of money." Lee is not alone in seeking enjoyment with the game. Riding the wave of this new pattern of spending for young adults who seek fun with a small amount of money, the business of claw machine games appears to be booming in South Korea. 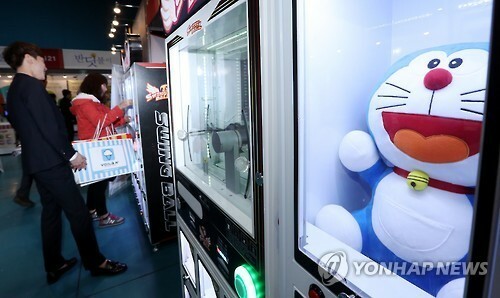 According to a recent report by the Game Rating and Administration Committee, a government organization in charge of overseeing game content, the number of registered claw machine shops nationwide jumped to 880 as of December last year, compared with 147 in August last year. The statistics did not include countless stand-alone machines set up near convenience stores, restaurants or subway stations. There are at least six claw arcade shops near the Hongdae subway station in western Seoul. At another claw machine shop in Hongdae, a 29-year-old manager, who declined to give his name, said 20-somethings and 30-somethings are the main customers. "If they buy a prize, it will cost between 10,000 and 20,000 won. But, if they capture a prize in the first attempt, it will cost just 500 won," the manager said. With an economic downturn and weaker domestic consumption forcing mom-and-pop shops to shut down their businesses, some of the vacant spaces are filling with claw machine shops. Some experts attribute the popularity of claw machine games to a growing group of consumers who don't have enough time or money to enjoy other leisure activities. Lee Na-young, an associate professor of sociology at Chung-Ang University, said, "For those who have the financial leeway and enough time to enjoy leisure, they would not choose doll-grabbing claw machines as something to do for fun." Claw machines could offer a way for those who seek "a greater sense of enjoyment and satisfaction with the smallest cost," the professor said. On an annual basis, South Korea's economic growth slowed to 2.3 percent for the final quarter of last year, compared with a 2.6 percent rise a quarter earlier. Private consumption rose just 0.2 percent during the final quarter of last year, down from a 0.5 percent gain a quarter ago. The Bank of Korea has warned that domestic consumption would be negatively affected by a corruption scandal involving President Park Geun-hye and a looming interest rate hike from the US. The Korean economy, which grew 2.7 percent last year, is expected to slow to 2.5 percent this year due to deteriorating economic sentiment, according to the central bank. Besides a gloomy economic outlook, the popularity of claw machines appears to be driven by a higher youth unemployment rate and a rise in the number of people who are grappling with heavy debt, the experts speculate. According to a report by the central bank, the youth unemployment rate in 2015 stood at 9.2 percent, marking the highest rate since 2000, while the overall unemployment rate was a decent 3.6 percent. Last year, a total of 96,319 people applied for a government-organized debt restructuring program after failing to repay their debts for more than 90 days, the Financial Supervisory Service said in a report. Thirty-somethings accounted for 27.5 percent of them, while 20-somethings accounted for 11.1 percent. The popularity of claw machines could be confirmed by an analysis of big data by artificial intelligence firm Daum Soft. In an analysis of millions of Internet blogs and social networking site accounts by Korean users, the number of shared words related to "doll-grabbing claw machines" stood at 18,118 in 2014. Last year, the number skyrocketed to 158,961. Daum Soft said the claw machines offer a small sense of achievement to young people in a highly competitive society at a time when their disposable income is shrinking.